New Mexico has one of the highest rates of drug and alcohol use and abuse in the nation. However, despite the alarming substance-related statistics in this state, there are multiple resources available for those seeking help and treatment. New Mexico is known as The Land of Enchantment. With its rich Native American history and deep spiritual roots, this unique and breathtakingly beautiful state holds hidden gems throughout its desert plains. New Mexico is home to other things hidden, as well. New Mexico has the second highest drug overdose death rate in the U.S., with the cause of death from drug or alcohol abuse occurring in eight out of every 10 deaths. While addiction is certainly an epidemic in New Mexico, this state also has a number of resources available for those seeking treatment for a substance use disorder. Whether for a family member or yourself, understanding the treatment options available in New Mexico is an important first step to lasting recovery. 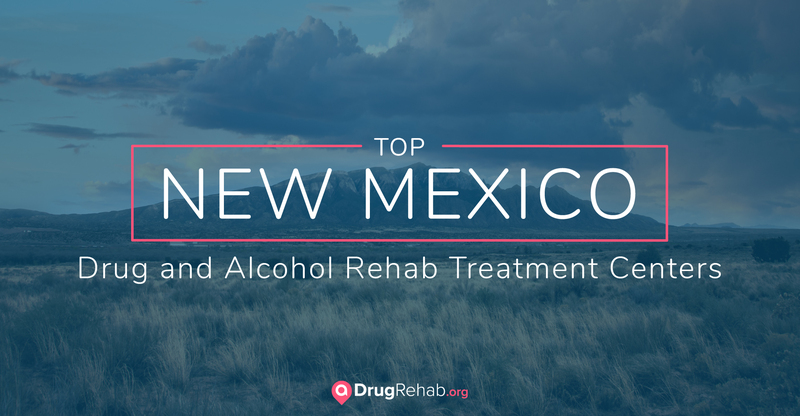 The following list of top drug rehabs in New Mexico is based on their amenities, overall experience and success rates. Life Healing Center in Santa Fe offers trauma and PTSD interventions in conjunction with drug and alcohol education and counseling. The center also addresses issues related to anxiety, depression, intimacy disorder, or bipolar disorder. This center focuses on empowering each resident to take charge of his or her own healing. Conveniently located near the interstate, this facility offers detox services, along with equine programs for residents. Turquoise Lodge Hospital provides treatment for those struggling with a substance use disorder in New Mexico. They offer a hospital-based setting in which patients can receive medically assisted detoxification services as well as intensive inpatient care. Turquoise Lodge Hospital specializes in and prioritizes treatment for pregnant women, women with children, and men and women seeking to regain custody of their children. The length of stay depends on the individual. Shadow Mountain Recovery in Taos is a men’s residential treatment facility that provides affordable and structured programs catered to men. They are located on 38 acres in the Sangre de Christo Mountains of New Mexico, making it a relaxing and revitalizing place to recover from a substance use disorder. This facility provides extended residential treatment programs, with emphasis on the healing power of a healthy body as well as mind, with physical activity and recreational opportunities available regularly as part of the typical program. They also offer stabilization services and treatment for co-occurring disorders. Hoy Recovery Program is a residential treatment facility that offers treatment in a safe, clinical, and trauma-informed environment. They pride themselves on being spiritually neutral and utilize a holistic approach that prepares each patient for a balanced and fulfilling life in recovery. A few of the many services they provide to residents include individual, group, and family therapy, agricultural therapy, skills training, detox services, poetry and art therapy, and 12-step meetings. Vista Taos Renewal Center in Taos offers primary, family, and extended care treatment. The four-to-six week primary stay includes medically supervised detoxification, individual and group therapy, family therapy, 12-step guidance, AA/NA meetings, grief and loss therapy, psychodrama interventions, psychiatric consultation, and mindfulness-based relapse prevention. The extended care program is for individuals who have completed the primary program and would benefit from support in transitioning back into their home and work environment. This program is offered from one month to one year and allows those in recovery extra time to rebuild their lives within sobriety. Santa Fe Recovery Center offers 30-day residential treatment programs to men and women over the age of 18 who are struggling with a substance use disorder. Admittance is determined by medical and/or clinical necessity and may include a three-to-seven day social detox. Santa Fe Recovery Center is a CARF-accredited inpatient facility that combines a traditional 12-step-based philosophy with evidence-based treatment programs. They work to help clients overcome the stigma of addiction and mental illness and start a new life in recovery. Radiant Recovery is a treatment program that uses traditional treatment methods seen in most rehab facilities with an extra element: nutritional intervention. The philosophy at Radiant Recovery is that some individuals are more sensitive to sugar, and this heightened sensitivity contributes to other addictions for some people. Radiant Recovery offers seven additional steps to follow alongside a traditional 12-step program to ensure a full and lasting recovery. The seven steps focus on making behavioral changes that will have a lasting impact on an individual’s life. One of the biggest fears many people have about getting sober is the withdrawal process. While withdrawing from drugs or alcohol alone can be uncomfortable and even dangerous, attending a detox facility can ensure that you or a loved one is able to withdraw comfortably and safely. Turning Point Recovery Center in Albuquerque, New Mexico, offers opiate and alcohol detox programs. They provide both inpatient and outpatient detox services, depending on the level of physical dependence and the patient’s individual needs. Their Detox House is a comfortable and private home-like environment with technicians and medical professionals on-site 24/7 to provide care and support to residents. Inpatient drug and alcohol rehab programs are often thought to be the best course of action to getting and staying sober. Inpatient treatment entails living residentially at a treatment facility for an extended period of time. This form of treatment is especially recommended for those with a severe addiction or who do not have a stable home environment and a supportive network. Most inpatient treatment facilities will design a treatment program that is centered around a patient’s unique needs and situation. This is often determined after a thorough intake evaluation at the beginning of a patient’s stay at the facility. Inpatient treatment centers generally offer specific lengths of stay, but this can vary depending on each person’s needs and requirements for recovery. Treatment lengths are typically either long-term or short-term, with long-term treatment ranging between 60-120 days or more, and short-term lasting around 30 days. Life Healing Center in Santa Fe offers short-term residential treatment to those seeking help from a number of addictions. The Center is located in a peaceful and nurturing environment and incorporates dialectical behavior therapy as well as other cognitive behavioral therapies into their treatment approach. Solutions Treatment Center, located in Santa Fe, New Mexico, provides long-term transitional living programs where clients begin by attending their extended day program while living in a supportive and comfortable environment. Their transitional living program is a minimum of 90 days but can last up to a year depending on the patient’s needs and progress in recovery. A dual diagnosis, or co-occurring disorder, is when an individual is diagnosed with a mental disorder in addition to a substance abuse disorder. Oftentimes, one can lead to or fuel the other. Common mental health illnesses seen alongside addiction include depression, anxiety, bipolar disorder, and others. Solutions Treatment Center in Santa Fe offers a number of treatment options for those struggling with co-occurring disorders, including adult and adolescent outpatient intensive treatment programs and transitional living and extended day programs. Their philosophy is that the root of the problem must be addressed and healed before an individual can fully recover, and they cater each patient’s experience to his or her unique needs and situation. Many inpatient treatment facilities offer gender-specific programs that are geared towards the unique needs of each gender. By nature, men and women experience life in general and a substance use disorder in particular differently, and therefore the approach to successful recovery is often different for each gender. Shadow Mountain Recovery in Taos is a men’s only residential treatment facility offering treatment in a structured and healing setting. Their services include medical stabilization and support, treatment for substance use disorders and co-occurring disorders, and many therapeutic activities. Luxury treatment facilities provide the traditional aspects of treatment in a comfortable and luxurious setting often accompanied by amenities such as gourmet meals and a spa. Luxury rehab centers are often more expensive than other treatment options. Vista Taos Renewal Center is a luxury treatment facility in Taos with a 16-bed capacity to ensure each guest gets the personalized care and treatment needed for successful recovery. Their treatment includes quality dining and rooms, individual and group therapy, medically supervised detox services, trauma-informed care, and mindfulness-based relapse prevention. Most inpatient rehab facilities require patients to pay out-of-pocket with the help of public or private insurance. The amount of coverage you receive for drug and alcohol treatment will depend on your insurance carrier as well as the plan you have. Some New Mexico drug and alcohol rehab centers also accept public insurance, such as Medicare and Medicaid. Before admitting yourself or a loved one to a treatment program, it’s important to call ahead and ensure they accept your insurance to avoid confusion or excess fees. In addition to utilizing options such as Medicare and Medicaid, those without private insurance or who are unable to pay the cost of treatment can also explore the low-cost and state-funded inpatient treatment available in New Mexico. Many treatment facilities offer grants and/or scholarships that cover some or all of the cost of treatment, while others provide sliding-scale payment plans based on a person’s income. If you or a loved one is unable to attend an inpatient treatment program due to work or other responsibilities, outpatient drug and alcohol treatment is an option to consider. The most beneficial form of outpatient treatment for those with a more severe substance use disorder would be an intensive outpatient program, which provides structure and an intensive approach to treatment similar to an inpatient program. Turning Point Recovery Center in Albuquerque offers intensive outpatient programs that focus on providing support for serious addictions while still allowing for the freedom to keep up with responsibilities. Their programs are held in the evening and require 12-step meeting attendance in addition to daily therapy. Prescription drug overdose-related deaths have seen an enormous increase in the past decade, with total drug overdose deaths in New Mexico increasing from 493 in 2015 to 497 in 2016. Additionally, New Mexico is a leading state when it comes to heroin and prescription opioid abuse rates. Other substances are an issue as well, with high rates of abuse seen with cocaine, marijuana, alcohol, and benzodiazepines. Adults aren’t the only ones affected by the drug and alcohol epidemic in New Mexico. Two percent of teens ages 12 to 17 have reported needing treatment for substances in 2015, and nine percent have reported using cocaine with 26 percent reporting daily alcohol use. While these statistics are certainly alarming, don’t give up hope. From arming yourself with knowledge and skills to resources and action steps, you can stop addiction in its tracks. Understanding the treatment options available to you or a loved one is the first step towards lasting recovery from a substance use disorder. For more information on finding a drug and alcohol rehab center in New Mexico, contact a treatment specialist today. * The facilities mentioned in this article are not affiliated with aDrugRehab.org.